Joy Creek Photo Archive (c) all rights reserved From Spain to Afghanistan. 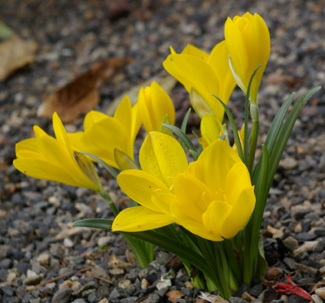 Just when you think the season is over, this bulb produces its lance-shaped leaves followed by bright yellow tulip-shaped flowers. This usually happens just as our rainy season begins and the yellow of the flowers serves as a reminder of the sunny season that has just passed. We grow our bulbs in a gravel bed where they get little extra summer water. They have flourished and increased well there.